several weeks ago, lesli, sara, erin, april, matt and i got together for dinner and a movie. whatever it was we ate was totally overshadowed by what we watched: Hamburger America, a movie profiling what it claims are eight of the best burgers in the country. while they were all intriguing, we were particularly interested in the Solly's Grill butter burger for sheer nausea-inducement combined with the fact that it is actually close to my hometown. in a discussion about the butter burger, my online scrabble friend shared with me her very own butter burger recipe in which the butter is stuffed, rather than slathered across. naturally, this increased my curiousity. so last friday, lesli, sara and i gathered for a butter burger meal (and a viewing of Pajama Game with Doris Day). we used butter mixed with garlic, parsley and salt, as directed by my online scrabble buddy. lesli and sara slathered their butter on top of their burgers; i chose to stuff mine and then, just for good measure, i put a few pats on top. i wore red sweatpants and my manny's shirt, which is slightly too small and features (as you can see) a large picture of a meaty sandwich--it seemed appropriate. lesli and sara bought upscale buns, so they did not, as the solly's buns are reported to do, disintegrate immediately. instead, the melted butter seemed to wrap itself around the entire outside of both top and bottom, creating a glassy sheen. i had, per my online scrabble buddy's suggestion, put cheese on my burger. this quickly melted and melded with the butter. and i also included a tomato which rapidly loss any semblance of its true identity as a vegetable -- it's taste was completely overpowered by the butter; it only added a bit of additional somewhat cheese-like texture. i'm proud to say that i actually finished my entire butterburger and i didn't even throw up. i even managed to have some cake and some peppermint bark later that night. oh, and when i go home for thanksgiving, my brother and i are going to Solly's to sample the real deal. i can't wait! I think Solly would laugh in your uppity face if you suggested mixing those fancy spices in with the butter. so true on both counts. he'd probaby kick me out of the restaurant. but i tell ya, those spices did wonders...it would've been rough to eat that thing if it had been straight up butter. yea! you're back! been busy? those burgers actually sound very good. can't wait to hear the review about the original Solly's! hi megwoo! i know, it's been ages. i'm ashamed because i haven't been busy. i've just been...uh, not blogging, i guess. hopefully i can maintain some level of participation in my little blog. Finally catching up on this blog. Did you know I grew up on Manny's? Alot of Thai immigrants worked there in the 70s and my dad used to take me all the time. aw dang. 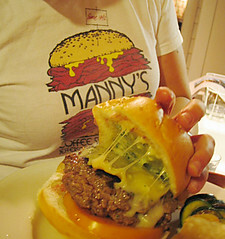 of all the things i miss about chicago, manny's is right up there. i swear, that place brings the city together like no other. and they actually have phosphates on the menu. I almost took off walking to Milwaukee when I watched that show! My mom's family is from Wisconsin, and I don't think they ever ate a hamburger like this. My husband and I watched the hamburger show on the History Station. I too, wanted to hop on a plane and get one. Oddly enough, a little place in our little town, opened up a place and they are selling Butter Burgers (yes they are from Wiconsin). Can't wait to try one.